Can you identify your target market? What you need to know and how it can help your business. I guess I should have expected that answer, but what I really meant was, Who really is your customer? Do you know? Do you have a true grasp on a detailed description of your target customer, so that you can tailor your marketing efforts to that audience? This saves time, effort and money in the long run, when you don’t waste your time trying to appeal to people who won’t be very responsive. You choose your market, and also choose your customers, even if you are doing this unconsciously. Many artists and craftspeople have had the experience of doing a show or fair, only to realize quickly that they are in the wrong place. Sometimes we take “whatever comes along” because it’s easier than doing the hard work of getting ourselves in front of the ideal customer for our work. And other times, we feel intimidated or not sure where to even begin. Start by listing information you need to know about your customers so that you can understand them better. Do they have certain interests, certain occupations or goals? What are their needs, their dreams, and what are they passionate about? Where do they live, and where do they shop? Why would they buy your work? It’s important to narrow your definition of the end consumer, but also understand who is making the purchase – they may be a different person. For example, you might make a product for women, which men are buying. Your childrens clothing line has to appeal to the parents, of course – especially mothers. That will affect your planning and your marketing. The more you understand the profile of your customers, the better able you will be to reach out to them and sell them your work. Targeted marketing is the method that most businesses today are using. Go where your customers are, and fill a need that they have. It’s a proven way to increase your sales and streamline your efforts, making them more efficient and saving money on your investment. Use your customer profile information to choose the best venue to display and promote your work and get in front of that buyer. When you have identified your niche market, start thinking creatively about how to craft your message to them. How to partner with causes they believe in. How to become a part of the community they belong to, the circles they travel in. Go beyond thinking in terms of advertising what you do, by finding out about them and what they do. Develop a relationship with your potential clientele by focusing on what matters to them. People buy from others whom they trust and believe in. How can you earn trust and loyalty from your customers? Do you know your customer? Take a few minutes and jot down your impressions. And the next time you are in the marketplace, face to face with your buyers, note who they are and ask them about themselves. You will find trends that you can use in determining how to best market your work to find that perfect customer in the future. Great article, I just recently entered a call for art, big show and didn’t get in, after looking at the entries I could understand why, my art didn’t fit in at all. I’ve learned to be selective as to what shows I enter but more based on if I thought there would be sales there, but have not looked at who my customers are, thanks to your article I will get on that! Melodie, it’s great to hear that you made the effort to look at the entries and see why this didn’t work for you. A scattershot approach never works very well, whereas when you understand where your focus is and hone in on it, you will find that your “luck” changes. so True. My art & values are eco-♡ ~ so I am applying that to all aspects of my biz. and using shipping materials that reflect this concern,,recyclable, biodegradable, sustainable. I enjoy thinking of my customers as much as possible, making profiles as you suggest And being a customer to my own biz.- what would I want? Kara, this is a smart way to reach an audience who shares your concerns. What’s more, when you genuinely believe in your cause, it is reflected in everything you do with your business. This serves to help you come across even more authentically. Good for you and all the best for your business! Carolyn – Thanks for this post. Great advice. “Strategic Customer Profiling” may sound calculating, but it’s just good business – and helps focus an artist’s limited marketing efforts. Brennan, Thanks so much for your comment – I completely agree with you. Your existing customers are your biggest asset. I’ve written articles on referrals, getting testimonials, and email marketing to your base for repeat business. Anyone interested in reading about these topics should click “Marketing” under the Categories tab and start reading! Great article Carolyn! For my kind of art I have found that the ability to deliver it in person tells me everything about the kind of people that buy my work. Lifetsyles, houses, tastes, income, age – it’s all there when you turn up on their doorstep. This has helped me to more accurately understand the type of average buyer. Of course, it is ever changing but I can tailor my marketing around the segment of the population that is more likely to buy. Thanks for a great read! What an excellent way to get to know your customers! You’re smart to engage them in conversation and get that type of information when in their home for delivery of your work. I hope you are keeping in touch to build those relationships and even ask for referrals. Your clients will be very flattered that you take such an interest. Great marketing technique! Always enjoy your articles Carolyn. The topic of who is your customer is one that I find hardest to tackle. As a wildlife artist I have no idea who would want to buy my art especially when I see how much the art world is dominated by contemporary and abstract, and dare I say meaningless decorative wall art. Gradually I am creating more contemporary work to better fit what I perceive to be necessary to even get noticed and I enter a lot of art exhibitions but often find myself thinking that unless there is a section for wildlife or animals my work just doesn’t seem to fit. This has lead me to be selective about what to get involved in which of course is limiting. I would love to know how to find out who would like my work then I might be able to ‘target’ them but so far I just draw a blank, I have no idea how to identify these people. Cynthia, I think the question “who is your customer?” can be easy for some artists to answer, and difficult for others. I believe that there are definitely people interested in wildlife art and to flesh out a profile of their other interests, and where you can find concentrations of this group is your task. For example, a couple of years ago I was asked to find a wildlife artist to create a commissioned piece as an award to a member of a forestry organization that worked very hard to preserve land and endangered species. Now, that is a niche group! Conservation organizations in general might be a place to start. And, even people interested in hunting. It depends on your portfolio and which direction you want to go. I wouldn’t encourage you to make contemporary art just because you think most other people are doing it. Make what truly inspires you, and you can identify your customer and reach them. 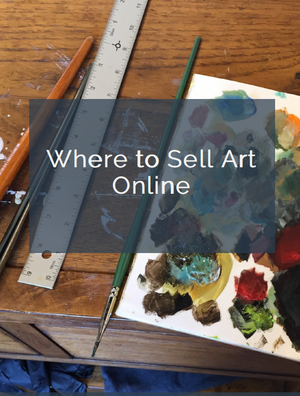 Thank you so much for this article Carolyn, Ive found over the years that its such a key aspect of working and selling paintings, knowing who you are selling to and the type of people that are your target audience. Your site is always full of great tips and info to keep me going strong with my abstract art. Thank you, David. I often speak at workshops, and this topic is a major part of my Marketing talk – it is important to all artists. 95% of people don’t buy original art or fine craft. Artists can forget about them … and hone in on the narrow range of people who are their most likely customers. Because if you try to sell to everybody, you will end up selling to nobody! Completely agree and thanks again for giving all this vital info to all the artists out there.